AUTOPCBACKUP (Auto PC Backup by MindSpark ) is a suspicious backup software that gets on your computer as a bundled software when you download and install other free software from the Internet. When Auto Pc Backup is installed on your computer, it runs on Windows Start-up, it compromises your security and displays annoying pop up ads. The Auto Pc Backup looks legitimate, but if you want to uninstall the program from your computer (Control Panel > Add/Remove Programs), then your computer freezes and the only way to get your computer back in operation is to shut it down using the power button. Technically Auto Pc Backup is not a virus and is categorized as a suspicious program, that may contain and install other malicious programs on your computer, like malware, adware, toolbars or viruses. When your computer is infected with AUTOPCBACKUP , then it continuously displays messages and advertisements. Another symptom upon infection, is that your computer speed may be slowed down due to malicious programs running on the background. Step 1: Start your computer in Safe Mode with Networking. When the "Windows Advanced Options Menu" appears on your screen, use your keyboard arrow keys to highlight the “Safe Mode with Networking” option and then press "ENTER". * Also works in Windows 7, Vista & XP. 2. Type “msconfig” and press Enter. 3. Click the Boot tab and check “Safe Boot” & “Network”. 4. Click “OK” and restart your computer. Step 2. 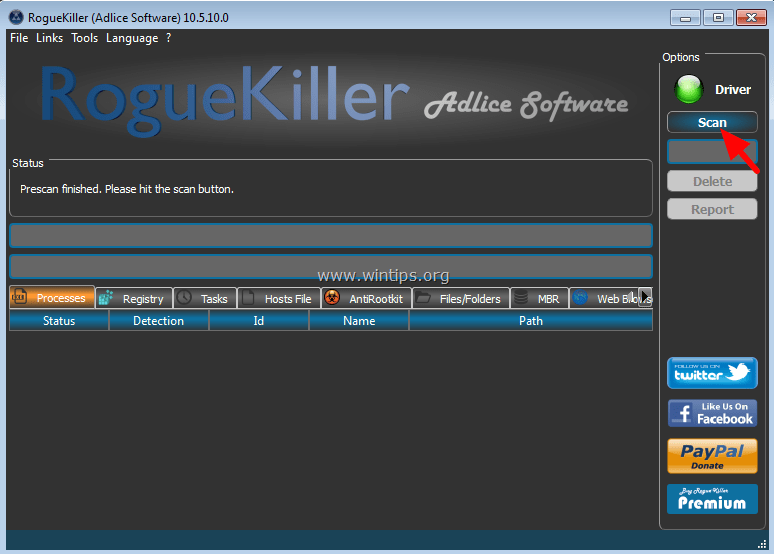 Remove AUTOPCBACKUP malicious registry settings with RogueKiller. Step 3. 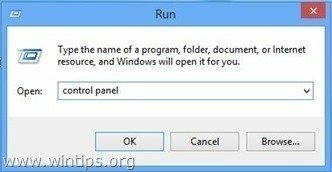 Uninstall AUTOPCBACKUP application from your Control Panel. AutoPCBackup Toolbar & Supporting Application. * Notice: If you receive the following error message during uninstall: “You do not have sufficient access to uninstall”, then follow this guide to uninstall all malicious programs and then continue to the next steps. Step 4. 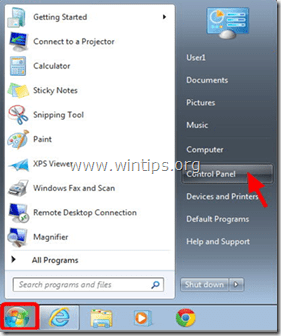 Manually delete remaining Auto PC Backup files. 1. Open Windows explorer and navigate to “C:\Program Files\” folder. Step 5: Remove Auto PC Backup with AdwCleaner. 1. 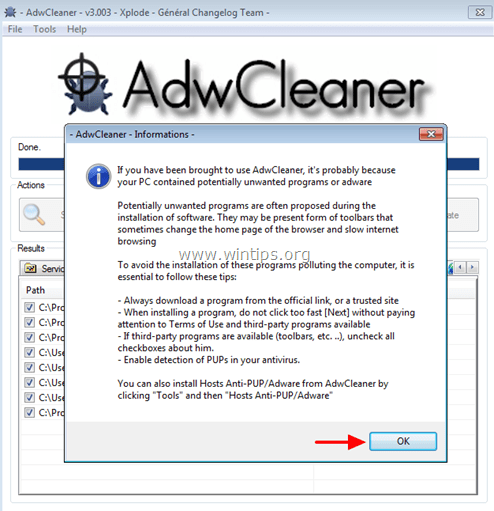 Download and save “AdwCleaner” utility to your computer. Step 6. Remove Auto PC Backup with the Junkware Removal Tool. Step 7. Remove Auto PC Backup with Malwarebytes Anti-Malware Free. 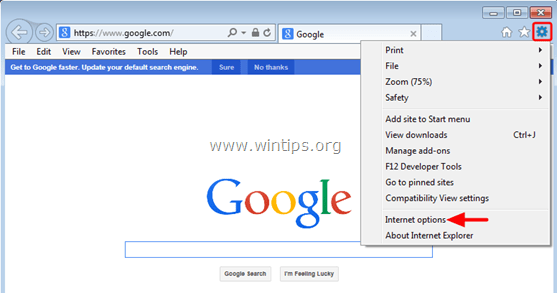 Step 8 – Optional – Remove Auto PC Backup Toolbar and Search settings from Internet Explorer, Chrome & Firefox. To ensure that “Auto PC Backup” infection is completely removed from your Internet browser, reset your Internet Browser Settings to their default values. Remove Auto PC Backup from Firefox.